'This is Laika's most accomplished film by far, not just in its animation but in the depth and reverence the studio brings to the Japanese mythology at the story's core'. What held back previous Laika releases ParaNorman and The Boxtrolls (to my shame I still have yet to see Coraline) from becoming truly great animated features is the stories they tell. Whilst both films offered perfectly enjoyable narratives which occasionally broached some perhaps unexpectedly mature themes, neither did enough to elevate the tales being told to the same level as the superb animation bringing them to life. Kubo And The Two Strings, Laika's fourth offering, goes some way to remedying this. The opening act establishes Kubo (Art Parkinson) and his situation with subtle brilliance, building characters and relationships from nuanced interaction, whilst also showcasing some of the studio's most exquisite visuals to date through the magical origami skills of the young protagonist. Director Travis Knight also shows a keen eye for character design, in particular through the supernatural Sisters (Rooney Mara) who are wonderfully unsettling. The plot becomes a more straightforward quest at the start of the second act, which is initially a little disappointing following such an original opening. Kubo's journey during this section at times feels overly episodic and driven by a MacGuffin of which neither the power nor the purpose is made clear enough. Whilst the set pieces are beautifully crafted - one action sequence involving a colossal skeleton is particularly breathtaking - at times they arrive somewhat unannounced and finish before you can fully appreciate just what a marvel of animation they are. 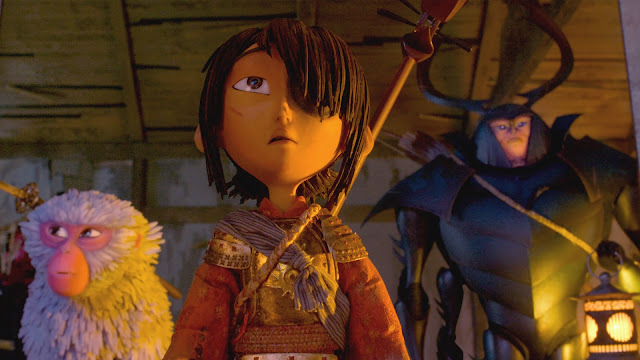 It's this lingering sense of Knight's film being a bit too simplistic and rushed in places that ultimately hold it back from true greatness, as there are several other areas where Kubo And The Two Strings comes close to perfection. This is Laika's most accomplished film by far, not just in its animation but in the depth and reverence the studio brings to the Japanese mythology at the story's core. There are occasional quibbles: despite boasting an impressively talented cast, it would have been nice to hear at least one Japanese voice amongst the four main characters of Kubo, his travelling companions Monkey (Charlize Theron) and Beetle (Matthew McConnaughy), and primary antagonist the Moon King (Ralph Fiennes). Nonetheless, Knight's artistry in bringing Eastern lore to life on screen is regularly reminiscent of animation giants Studio Ghibli. Whilst Laika never quite reach the heights of the Japanese studio's finest here, comparisons such as this serve to show just how good Kubo And The Two Strings is when at its very best.